Solid wood blocks are a rarity, it seems. I first encountered them at The Yoga Room in Berkeley, California. 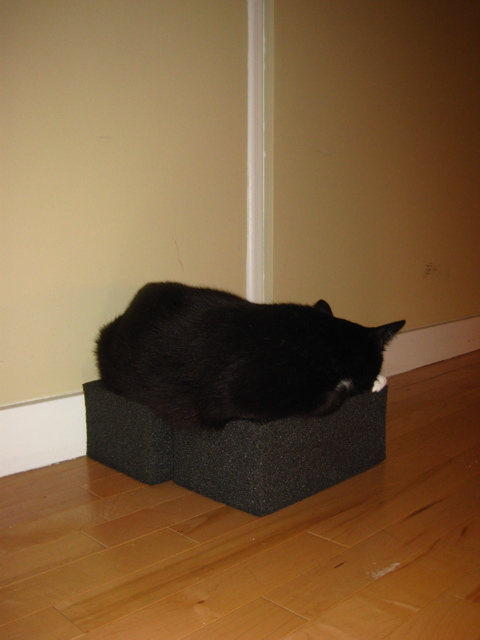 But I soon realized that most studios buy foam blocks. They cheaper, for one thing. They’re also lighter and can’t crush a foot when dropped. But only solid wood has that satisfyingly solid heft. 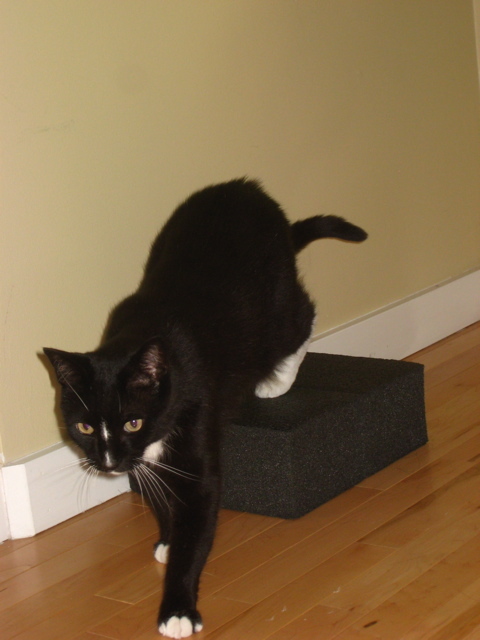 Currently I use foam blocks from Yoga Props in San Francisco (great indie retailer; terrible web design). They’re larger and sturdier than the typical foam block, which are flimsy, easily dented, and liable to topple. They’re over a decade old and still in fine condition (ignore the faint bite mark from my late kitty Gingy, plus the strange glossy spot from a close encounter with an infrared heater). When placed side by side, they’re now a miscellaneous prop for the newest household member, Sylvester (“Sly”). Mass-produced wood blocks are typically hollow, such as Vancouver yoga retailer Half Moon’s cedar blocks, made in British Columbia. Sure, they’re lightweight, fragrant, and probably well-made. But I’m holding out for the real thing. Do you know a woodworker who can make such blocks? actually, funnily enough, there’s a carpenter here in Nova Scotia who makes solid wood yoga blocks. The Yoga Loft (which is closing this month 😦 ) used to carry them. They were beautiful and about 30$ a pop. I really love my bamboo block, but most of all, I heart my cork block. It’s sustainable, softer than wood but still heavy. Also, doesn’t slide or move on the floor like wood does. it’s perfect. I agree with the cork block suggestion. I love their combination of heft and softness. Wood blocks, although they used to be my favorite, are simply too heavy, clunky, and loud in class if they get knocked over. I have a friend who does a lot of woodworking in his spare time. He’s made us a few gifts over the years and does quality work. I’ll have to ask how hard solid wood blocks would be to make and how long it would take. That’s an idea I never thought of. Thank you! Would you want some if they are handmade by him? Cork blocks. I once encountered them at a retreat with my teacher in Haida Gwaii. I did appreciate their “feel,” a combination of “heft and softness” indeed. Heather, ask for me, but I want first to research locally (to avoid shipping costs) and in my home island of Hawaii (for nostalgic connection!). What type of blocks do you have/use/favor? On my wish list: a wooden halasana bench! Next Next post: Why Anusara?